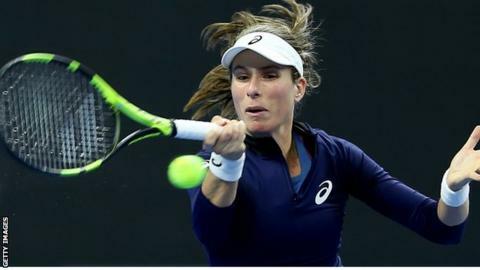 British number one Johanna Konta advanced to the Kremlin Cup quarter-finals with a 6-4 3-6 6-3 win over Australian Daria Gavrilova in Moscow. Konta was a set and 2-0 up before her Moscow-born opponent, ranked 38, won six of the next seven games to level. But Konta, ranked 44, went 3-0 up and won in two hours, nine minutes. Meanwhile, at the European Open in Antwerp, Britain’s Cameron Norrie needed only 63 minutes to beat Spain’s Marcel Granollers 6-3 6-2. He will play Argentina’s world number 17 Diego Schwartzman in the round of 16. In the last eight in Russia, Konta will play world number 31 Aliaksandra Sasnovich of Belarus, who came from behind to beat fourth seed Kiki Bertens 6-3 4-6 6-3. Bertens needed to make the semi-finals to qualify for next week’s WTA Finals in Singapore but her defeat secures a place for Karolina Pliskova. However, world number 10 Bertens may yet compete in Singapore, with world number one Simona Halep currently troubled by a back injury. Caroline Wozniacki, Naomi Osaka, Sloane Stephens, Angelique Kerber, Petra Kvitova and Elina Svitolina are the other qualifiers.